It took a number of years before the improved Yttrium Vanadate phosphors became widely available in the former East European countries. In part this was due to the high cost of the raw materials, in particular europium. Several alternative phosphors were tested in the laboratories of the Tesla company in former Czechoslovakia. This lamp bears a coating of calcium halophosphate, the material more commonly employed in linear fluorescent tubes. 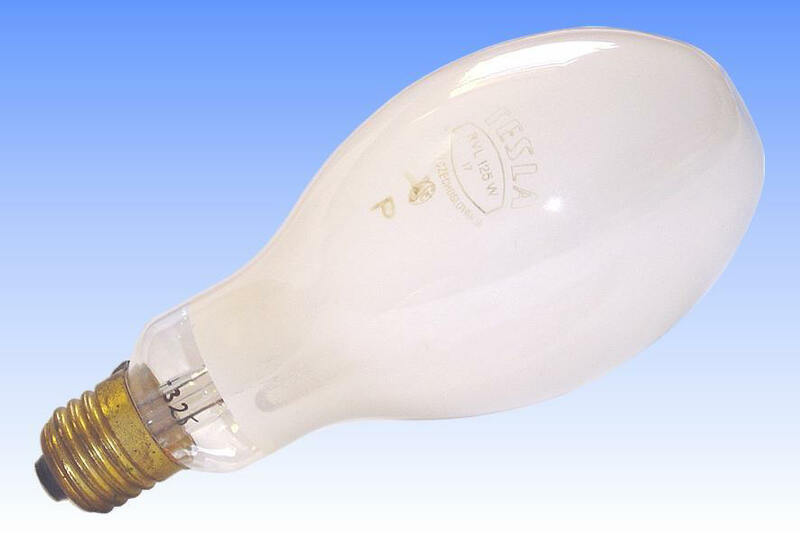 It was found not to be an especially effective material for the high pressure mercury lamp. Its peak absorption lies at shorter wavelengths, such as produced by the low pressure discharge in a fluorescent tube. 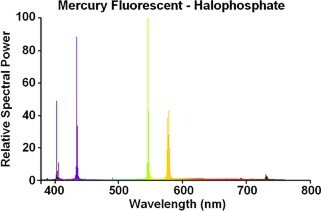 The high pressure discharge radiates its ultraviolet at somewhat longer wavelengths, where the absorption curve for halophosphates drops off. The total amount of radiation added to the discharge is consequently rather low. Indeed this phosphor coating absorbs more radiation than it actually contributes, thus the luminous efficacy is lower than for clear uncoated types. The CRI remains low and the red ratio is just 4%. 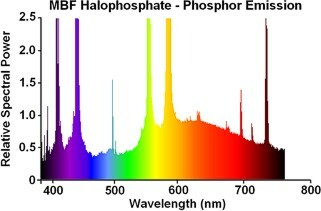 The colour and efficacy of the halophosphate lamp is considerably inferior to fluorogermanate lamps that were already widely available before its development. Its colour is however somewhat better than a plain clear mercury lamp. It can only be presumed that these curious lamps were offered as a low-cost alternative to standard coated mercury lamps. They were marketed for a brief period by Tesla under the RVL-B classification, B = bilá (white).